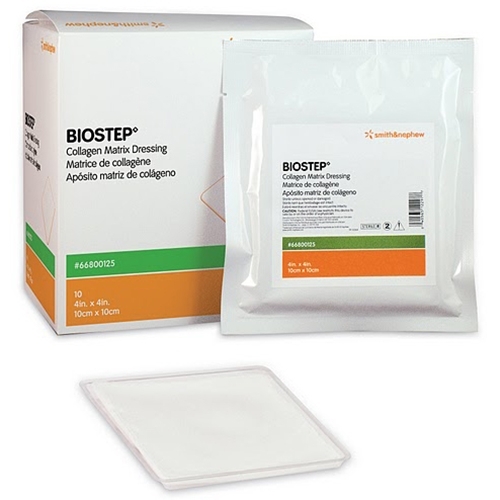 Biostep Collagen Matrix Wound Dressing from HealthyKin.com is a unique collagen matrix dressing that allows you to overcome barriers to wound closure while maintaining an optimal moist wound environment. It targets and deactivates excess MMPs and has a 6-day wear time for prolonged control of the wound environment. The highly conformable dressing is easy to apply, and its gelling actions provide a cooling, soothing effect for enhanced patient comfort. Unique Dual-Action MMP Targeting & Deactivation - MMP Targeting: contains both type 1 and denatured (gelatin) porcine-derived collagen. This novel collagen matrix attracts and serves as sacrificial substrates for a broad array of MMPs which are found in excess within, and contribute to the chronicity of, chronic wounds. MMP Deactivation: contains EDTA (a proven MMP modulating agent) which permanently deactivates excess MMPs, providing prolonged, targeted MMP control without altering the activity of essential growth factors. This contributes to a longer wear time. Patient Friendly - CMC within dressing gels on contact with moisture providing improved patient comfort by creating a soothing, cooling effect upon application. Up to a 6-day wear time provides for fewer dressing changes and prolonged control of wound environment. Easy to Use - CMC within dressing adds structure for easy application when moist. Highly conformable to ensure close contact with wound bed. Moisture Manager - Alginate absorbs a high level of exudate away from the wound bed to the secondary dressing maintaining an optimal moisture balance for wound closure.